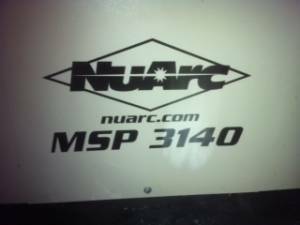 MSP 3140 features NuArc's patented instant-start power technology, which reduces glass temperature, power consumption, and environmental heating effects. With a 79 x 102 cm (31" x 40") maximum screen frame size, it's an ideal choice for those entering automatic printing and for quality-conscious printers in manual environments. MSP 3140 is designed for those seeking superior performance at an affordable price. NuArc's computerized and programmable integrator/controller ensures precise vacuum duration and lamp output compensation. MSP 3140 is also simple to operate. The entire exposure process--from vacuum drawdown through screen exposure and vacuum release--is accomplished with a single keystroke. NuArc's unique manifold system ensures intimate contact by drawing vacuum evenly around the perimeter of the blanket frame. 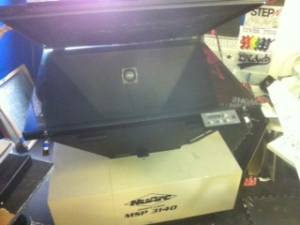 A 1200-watt multi-spectrum metal-halide lamp, with its ability to retain fine lines and dots, produces exposures of exceptional quality. 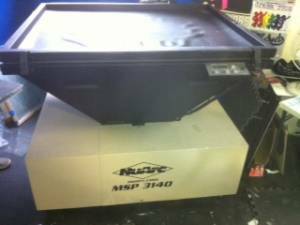 MSP 3140 can be located in areas housing unexposed screens because the light source and vacuum frame are enclosed, and the exposure lamp can't be turned on while the blanket frame is open. Is the unit located in Dallas area? Yes the Exposure unit is in Dallas Texas. Would you sell for $2500?